"Prof. D Sriram has been selected for the prestigious Tata Innovation Fellowship of the Department of Biotechnology, Government of India for the year 2015-16 in recognition of his outstanding research contributions. The fellowship is meant to honor and encourage scientists involved in translational research dedicated to finding solutions by innovative scientific knowledge and platform technologies". 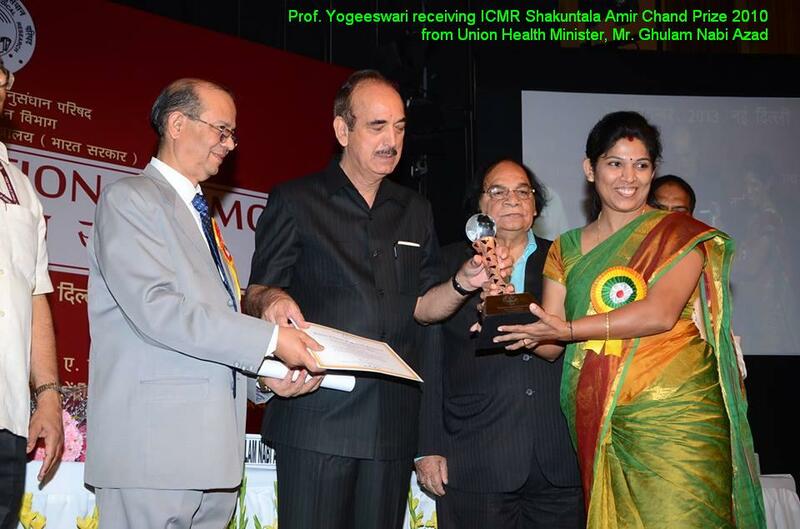 Prof. Yogeeswari receiving ICMR Shakuntala Amir Chand Prize 2010 from Union Health Minister, Mr. Ghulam Nabi Azad Click here for Photo. The Director Prof. V.S.Rao congratulates Prof. D.Sriram on being appointed as Shri B K Birla & Smt. Sarala Birla Associate Chair Professor. The department of pharmacy successfully received a grant of Rs. 60 lakhs from DST under Fund for Improvement of Science & Technology under Level-I for 5 years starting from 2012. The following students are selected as CSIR-Senior Research Fellows recently. As part of the Indian Council of Medical Research (ICMR) Centenary Celebrations, Dr D.Sriram of Pharmacy Dept, Birla Institute of Technology and Sciences, Pilani – Hyderabad Campus receives the prestigious Shakuntala Amir Chand Prize.